The Early Mediaeval Coin Complex from Semirechye. in the Area of Kyrgyzstan. Bishkek 2002. 144 pp. with illustrations, maps and tables. In Russian. 2303 coins listed. 55 basical types illustrated (rubbings). Soft cover. Edited in 300 copies. Early in the 7th century, active trade relations with the Far East resulted in establishing the monetary circulation in Central Asia. The Great Silk Road brought bronze coins of the Tang dynasty to Semirechye and further to Bukhara and Samarkand. The settled population of Semirechye and Soghd eagerly adopted the traditional Chinese coins with a square hole in the centre. A number of Chinese coins belonging to the earliest issue of Kai yuan tung bao type, found in the Chu Valley, indicates that the urban population of Semirechye was not only familiar with those coins, but also used them widely as a means of circulation. The original local coins produced there since the beginning of the 8th century looked similar to the Chinese ones, but they bore, instead of four characters, a Soghdian-like Uyghur legend "Fan [i.e. 'money' or 'coin'] of the Master, Türgesh Qaghan" and the Türgesh tamgha embracing the square hole on the reverse. A comprehensive study of more than two thousand coins found on the ancient town sites of the Chu valley during the recent years allows us to state the virtually concurrent appearance of the two coin-producing centres - one in the Chu Valley (most likely at Suyab) and the other in Taraz. 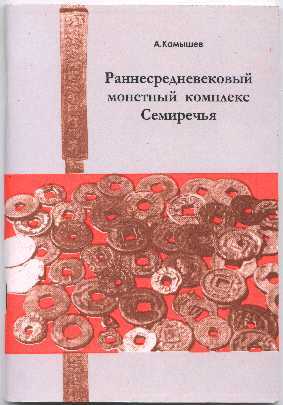 Judging by the similarity of legends, size, and weight of the coins from both centres, a simultaneous monetary reform in the cities of Semirechye could have been carried out, presumably organized with the assistance of Chinese mintmasters, to which high quality and elegance of the first Türgesh coins is witness. As the money circulation was growing up, other towns would be involved in the coin production, which would lead to the deterioration of quality and slight, but steady reduction of coin weight and size. The defeat of the Chinese troops in 751 on the river Talas and the ensuing economic crisis in China governed by the Tang dynasty, led to certain changes in the monetary circulation in the Empire, viz. issue of Qian yuan zhung bao ordinary units having reduced weight and diameter (758-759) and introduction of conventional denominations of 10 and 50 cash. Similar changes, just with some delay, took place in Semirechye. The undersized Türgesh and Tukhus coins emerged with ever succeeding reduction of weight. On the other hand, one can observe the issue of big-size Türgesh coins, presumably representing multiple denominations, although of weight increasing only slightly. This assumption can be reinforced by the findings of rare Türgesh coins very close in weight and size to the Chinese 50-cash units. The Qarluqs did not interfere in the monetary relations established by the Türgesh Qaghans. The local market was filled with coins produced in the big cities of Semirechye. It should be noticed that, according to observations, Suyab (modern Ak-Beshim) went on producing the series of Türgesh coins, while Taraz issued the coins of Yinal Tegin and Vakhshutav, and Navekat (the 'New York city' on Red River) started casting the currency to the Tukhus type. Simultaneously, most (if not all) of those towns of Semirechye produced the deteriorated imitations of Chinese coins. The continuing process of inflation led to the further corruption of coin types, manifesting itself in the emergence of small Türgesh and medium-size Tukhus coins, and finally brought to the complete degradation and appearance of coins entirely devoid of legends - a convincing evidence of economic decline in the 9th century. In the course of the monetary reform carried out by the predecessors of the Qarakhanid dynasty, new coins with the Turkic legend Fan of the Master Arslan Bilgä Qaghan were issued into circulation, thus marking the termination of the crisis by the late 9th - early 10th century. The series of pre-Islamic medieval coins of Semirechye is completed with the earliest anonymous Qarakhanid issue, traditionally shaped in the Chinese style, yet with the legend written in Kufic script. The above-suggested sequence of coin issues in Semirechye, generally undated, is confirmed by a number of features inherited from one type to another due to their continuous degradation. The analysis of coin moulds of the large Türgesh coin series has disclosed certain differences enabling the chronological distribution of separate issues. The discovery of a whole set of local imitations to Chinese coins and determination of the time of issue allows us to reconstruct the history of money circulation during the reign of Qarluqs. The exact dating of the coins of Semirechye allows us to reconsider the time when certain archaeological monuments existed and when they were destroyed, especially those the dating of which has been based on numismatic data. For example, the existence of Buddhist temples in the town of Ak-Beshim should not be dated to the end of the 7th century, as it has been considered before, just to the mid-9th century, and their decay should not be connected with Türgesh, just with the emergence of the Qarakhanid dynasty that brought Islam to that region. The introduction of new coin types into circulation has allowed us to elucidate a lot of important aspects of our national history.